In the aftermath of No Child Left Behind, schools and students are judged and even funded by how well they perform on prompted writing tests. In a questionable attempt to insure success, many schools have adopted formulaic approaches to student writing that drain enthusiasm for writing and cause test scores to plateau at the mediocre level. What can we do? Barry Lane has the answer: Get Hooked on Meaning and the craft of real writing. In his DVD/VHS you will find 12 simple lessons teachers can show directly to students, grades 3-8, before the test. This material, and the entertaining way it's presented, will improve both the attitude toward the test and also teach aspects of the writers craft. 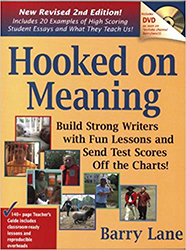 Composed of short, entertaining three minute segments and simple exercises, and enhanced by a 120 page study guide filled with extra lessons, posters, and overhead-ready examples, Barry Lane's Hooked on Meaning is the perfect tool for incorporating prompted tests into a meaning-based writing program. Show it directly to your class or use it as a professional development event for your faculty. Barry Lane is a writer who teaches writing and the founder of Discover Writing Company, which for the last 20 year has provided professional development in writing and reading for teachers K-12 and beyond. His popular books help aspiring writers of all ages hone their craft and find their unique voices. His presentations are hilarious but underneath the humor there is always the same strong message: Writers write for the same reason readers read--to find out what's going to happen.